A Church in Saudi Arabia? 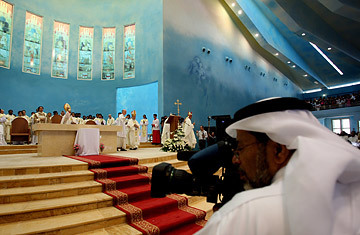 A cameraman films the first mass held at St. Mary's Roman Catholic church in Doha, Qatar, on March 15, 2008. Interfaith dialogue has become an important exercise in finding the right words to overcome both extreme violence and ordinary misunderstanding. True progress, however, is best measured in deeds. The inauguration last week of Qatar's first Christian church  a small Catholic chapel bearing neither bells nor visible crosses  has been hailed as a welcome step forward in relations between Catholicism and Islam. But an even more dramatic development is under discussion just across the border: The Vatican has confirmed that it is negotiating for permission to build the first church in Saudi Arabia. While Christians in those areas trace their roots to the earliest centuries of the faith, the Catholics in Saudi Arabia are mostly migrant workers. And the restrictions on any outward manifestation of their religious beliefs have been particularly severe. The celebration of non-Muslim holidays is forbidden, as is the wearing of crucifixes and other religious symbols. Benedict has been seen as both stumbling block and catalyst in the search to improve relations between Christians and Muslims. His Septempber 2006 lecture at Regensberg University in Germany on the relationship between faith and reason, and how it might explain religiously inspired violence, included an offensive historical reference to the Prophet Muhammed. But after initial Muslim anger at his remarks cooled  and the Pope made a conciliatory visit to the Blue Mosque in Istanbul  there have been signs of a productive Catholic-Islam dialogue taking shape. Prominent Muslim and Christian clerics have exchanged messages expressing a mutual desire for better understanding, and Vatican officials last month announced the first in a series of high-level meetings with Muslims next November, which will include an appearance by Benedict. In little-reported remarks just three months after his controversial speech in Germany, the Pope spoke of the challenge posed to Islam by a violent minority within its ranks. "The Muslim world today is finding itself faced with an urgent task. This task is very similar to the one that has been imposed upon Christians since the Enlightenment," Benedict said in a speech to officials of the Roman Curia. "On the one hand, one must counter a dictatorship of positivist reason that excludes God from the life of the community and from public organizations, thereby depriving man of his specific criteria of judgment. On the other, one must welcome the true conquests of the Enlightenment, human rights and especially the freedom of faith and its practice, and recognize these also as being essential elements for the authenticity of religion." After Easter week, Benedict will no doubt be focusing on his next big speech, where some of the same themes may very well recur. On April 18, the pontiff arrives in New York to address the General Assembly of the United Nations.